Precious metals were divided in their kick off to the new trading week on Monday with platinum and palladium rising and gold and silver falling. Gold for August delivery declined $5.50, or 0.5%, to settle at $1,225.60 an ounce on the Comex division of the New York Mercantile Exchange. "We’re seeing a bid in the dollar that’s driving the gold low today, but we do think the dollar is set to weaken going forward, so we do see gold trading higher on the near term, two to three months outlook," Reuters quoted Daniel Ghali, commodities strategist at TD Securities. 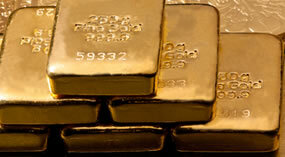 Gold futures traded from a low of $1,222.20 to a high of $1,235.20. They declined 0.8% last week. On Thursday, they posted their lowest close since July 13, 2017. Silver for September fell 12.4 cents, or 0.8%, to end at $15.425 an ounce. Silver futures ranged from $15.35 to $15.58. They dropped 1.7% last week, for their sixth straight weekly decline. On Thursday, they logged their lowest settlement since April 8, 2016. October platinum rose $1.50, or 0.2%, to $831 an ounce, trading between $825.90 and $838. Palladium for September delivery advanced $13.70, or 1.5%, to $902.60 an ounce, ranging from $875.60 to $908.80. Last week they registered respectively losses of 0.1% and 4.7%. Gold fell $3.80, or 0.3%, to 1,224.95 an ounce. Silver rose 11.5 cents, or 0.8%, to $15.485 an ounce. In LBMA results last week, they logged declines totaling 1% for gold, 2.8% for silver, 0.8% for platinum, and 5.5% for palladium. United States Mint bullion sales rose by 190,000 ounces in American Silver Eagles and a combined 2,500 ounces in American Gold Eagles.